Tracfone's NET10 and Telcel America brands unveiled a slew of new plans today. 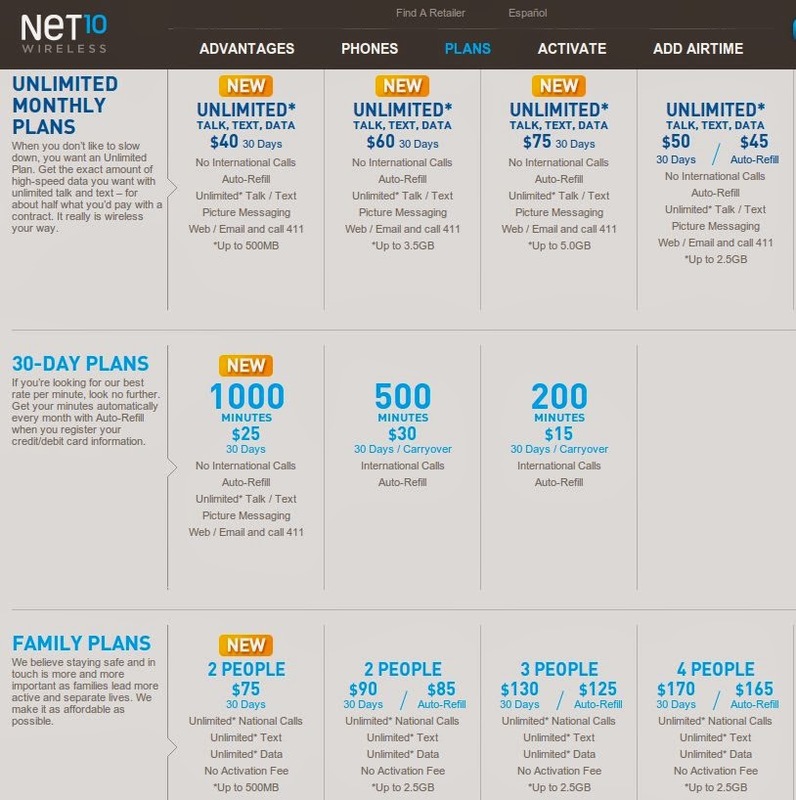 The plans are listed on the NET10 and Telcel America Websites. However I haven't seen any announcement by TracFone and the sites are lacking details like eligible phones and which plans, if any, require auto-pay. Here's what I've been able to gather. There's also a new $75/month 2 person family plan that includes unlimited talk and text and 500 MB of high speed data. It's not clear if the 500 MB is per line or shared. I believe that all the above plans can be used with smartphones, presumably including BYOP devices. There's also a change to $25 plan for non-smartphones. It now includes 1000 minutes instead of 750. The existing $60 plan with unlimited talk and text, including international*; 1000 minutes to Mexican mobile numbers and unlimited data (2 GB of data soft cap) is still available. * Unlimited international calling is to landlines only and is restricted to calling no more than 15 different international numbers per month. I've been told by a Telcel dealer that all of the plans can be used with smartphones although I have my doubts about the $29 one. I will update this post with more details as they come in. I have 3 lines no contract with 2 cell companies. None of which are Tracfone. I know a lot of people disagree with the dishonest and misleading policies of Tracfone's brands on data. But, you can't really be mad at Carlos Slim. This guy has enough money to buy a National carrier here but instead he rather runs a MVNO that uses their networks. His MVNO brands all in all have over 20 million people as his customers. So Slim must be doing something right. You have to admit some of these plans are kind of attractive and could draw in even more customers. However, I do think that Tracfone should honer their policies and not cut people off early for data if they use too much one day or one weak; they should honor whatever they promote rather or not if you use a lot of data upfront or spread it out over the course of the month; they shouldn't throttle or cut you off early as people have complained about. What's the catch on that $25 plan? Can you use smartphones? Is it "3g" instead of high speed data? I use primarily data and texts and wish there were more offerings that gave fewer (than unlimited) voice minutes for lower fees. I had the $25 Virgin plan, but am having coverage issues and need to move off of Sprint. Only NET10 branded feature phones can be used on the $25 plan. I actually use the $25/month plan on N10 from time to time. Great plan. Looks like it will be even better now!! If you want a feature phone only, then this is the way to go. Their sister brand, Tracfone, comes nowhere close to this. Also, the $40 smart phone plan looks interesting. Could potentially fill a void in their lineup. The way the data is throttled kinda reminds me of T-Mobile MVNO's. Anyone think America Movil might be switching to Tmo as their primary GSM carrier? Interesting. I just checked for one phone I have, and the plans are showing up when in my account and apparently I could switch to one of the new ones. Why does it say unlimited talk/text on the new $25 1000 minute plan. Typo? Yes, that has to be a typo. New Net10 Monthly Plans $35 Unlimited Talk & Text plus 500MB of Data @ 4G LTE Speed/30Days, $40 Unlimited Talk & Text plus 1.5GB of Data @ 4G LTE Speed/30Days.